This relates to the Lucas 16/17/18ACR as fitted to the MGB, circuit elements have been copied form the Leyland Workshop Manual. There are many different types of alternator from many different manufacturers and the internal details can vary considerably. What's inside and how it's components function: There is a field winding on the armature to generate a magnetic field, three fixed stator windings to provide the output, a diode pack consisting of nine diodes, and a voltage regulator. For connection to the outside world it has the positive 12v output terminal, an IND terminal, and of course an earth through it's physical mounting to the engine. Unlike a dynamo which has its field windings fixed to the dynamo casing and output windings on the armature, the alternator is the other way round. This is because when at maximum output there is far more current flowing in the output windings than in the field windings. The armature brushes on a dynamo limit the maximum current that can flow both because of the resistive nature of the graphite or carbon brushes, and because they are running on a commutator which is continually connecting and disconnecting current which creates arcing, and high current damages the brushes and the commutator. By reversing the function even though graphite or carbon brushes are still used in an alternator, they are running on continuous slip-rings rather than a commutator, so arcing is eliminated as well as current reduced. Another benefit is that because the field-wound armature of the alternator has a significantly lower mass or weight than the output-wound armature of a dynamo, it has a higher maximum rpm. This is utilised by the alternator having a smaller pulley than the dynamo, so it spins faster for a given engine speed, which also increases output. The downside of all this is that alternating current (AC) is generated in the stator of an alternator (hence its name) rather than the direct current (DC) from the commutator of a dynamo. AC is no good for charging a battery and operating many automotive electrical systems, so it has to be 'rectified' to DC which is the job of the diode pack. But first, the stator or output windings. Whilst the field winding is a simple coil of wire wound onto the armature, the stator is attached to the body of the alternator and consists of three coils, connected in 'star' formation i.e. 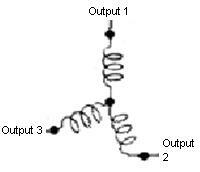 one end of the three coils are connected together, and the other ends provide three AC outputs. Because of the way the three coils are positioned and interconnected they generate AC in three different phases, i.e. three overlapping positive pulses of current and three negative for each magnetic pulse from the armature. Additionally the armature has 12 poles, each of which generates an output pulse in the stator windings, so generating 36 output cycles of AC for each revolution of the armature. As said AC is no good for automotive electrics, and this is where the diode pack comes in. 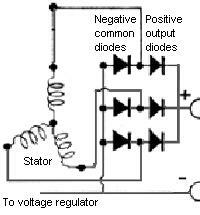 There are three positive output diodes, three positive control diodes, and three common negative diodes. 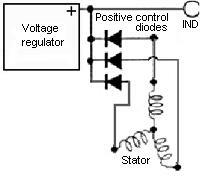 The negative diodes can be used for both output and control circuits as they are connected together at the negative terminal of the alternator. Separate positive diodes are needed as they go to different parts of the alternator. The diodes are connected such that negative half-cycles of output are converted to positive half-cycles - full-wave rectification, so now we get 72 pulses of positive voltage for each rotation of the armature, which gives a much steadier DC current flow. 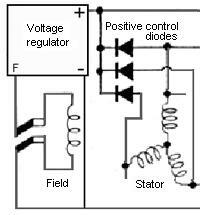 The output positive diodes are all connected to the positive output terminal of the alternator, and the control positive diodes are all connected to the input terminal of the voltage regulator. There is still quite a lot of 'ripple' in the output voltage, but when connected to a 12v car battery this ripple is smoothed still further to become - to all intents and purposes - a steady voltage, and it is this steady voltage that powers all the cars components. This is why an engine with an alternator should never be run without a battery connected, as this further smoothing action is lost, and some quite high voltage spikes can be generated which are capable of damaging electronic components at least, and may even blow bulbs. As said the three control positive diodes feed voltage to the input terminal of the voltage regulator. The voltage regulator 'sees' the same level of voltage from it's control diodes that is being sent to the alternator output terminal by the output positive diodes. Changes in voltage at the output terminal will be caused by changing electrical loads on the car, which changes the current being drawn from the alternator. The alternator stator has resistance and when a current flows there is a certain amount of voltage 'lost' in this resistance. 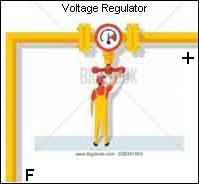 As the current increases - more loads switched on - the lost voltage increases, which means the output voltage reduces, and vice-versa. Left to its own devices there would be huge variations in output voltage with changing electrical load which is undesirable, ideally we want to maintain a constant voltage at all times. The voltage regulator is effectively a variable resistance (or control valve) between the output voltage and the field winding. As more electrical loads on the car are switched on and output voltage is seen to drop, the voltage regulator reduces the resistance in series with the field winding, feeding more current to it. This increases the magnetic field around the stator and hence increases the output voltage. Conversely as electrical loads are switched off and current through the alternator reduces, the output voltage rises. The voltage regulator increases the resistance in series with the field winding, which reduces the current in the field, which reduces the magnetic field and hence the output voltage. This increasing and reducing of current through the field maintains the output voltage at about 14.5v, which supplies all the cars electrical loads as well as trickle-charging the battery. In theory these changes are instantaneous and not visible if testing with a voltmeter. However each alternator has a maximum current that it can deliver without damage, and the system is designed such that as the maximum current capacity of the alternator is approached, each increase in current from the load is not completely compensated for by the voltage regulator, which means the output voltage will reduce as the current load increases. When the maximum capacity is reached the output voltage will have fallen to nominal battery voltage i.e. about 12.8v. Any further increase in current will be taken from the battery, reducing its voltage, and not the alternator, and the more current that is taken over what the alternator can supply the more the battery voltage will drop. With the 35 to 45 amp alternators fitted to the MGB you can see the voltage start to reduce from the minimum load level of 14.5v with only some loads switched on. With higher-rated 80 amp, 90 amp and even higher alternators fitted to modern cars the voltage drop with increasing load is much less noticeable until again the maximum current capacity is approached. The Workshop Manual gives the maximum current at 6000 rpm, but it will be significantly less than that at idle and lower engine speeds. If a significant part of your journey is stuck in traffic for any length of time at night and in cold and wet weather, consideration might need to be given to reducing the load by not sitting there with the brake lights on (3.5A) and switching certain things off such as headlights (7.5A), heated rear screen (8A), wipers (3A) and heater fan (3A). The more your journey involves driving at 30mph plus the less this is an issue. Finally the INDicator terminal. This has the same voltage as the input to the voltage regulator, which is the output of the stator via the control diodes, hence is the same as the output voltage on the positive terminal going to all the cars electrics. It has the same functions as originally with dynamo systems - i.e. lighting up to show the ignition is switched on, and then extinguishing as the engine is started and the dynamo or alternator starts charging. The ignition warning light is initially powered with 12v from the ignition switch. 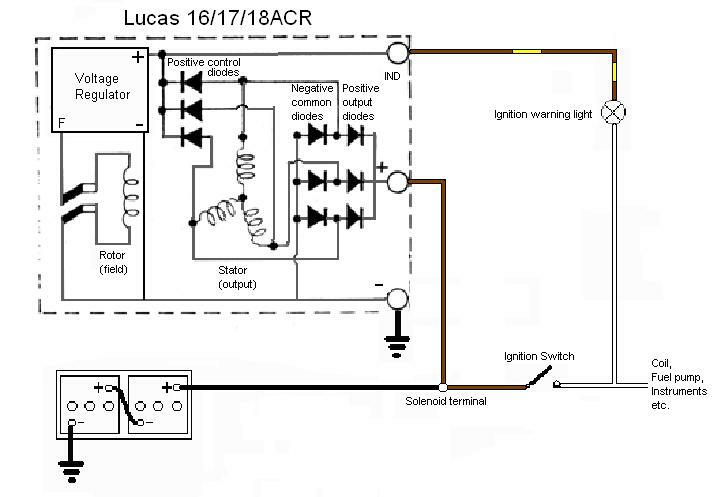 With the alternator not charging and no output voltage being fed to the voltage regulator, it is set to its lowest resistance, so current from the ignition switch passes through the ignition warning light and the voltage regulator to the field winding and thence to earth, so lighting the warning light. When the alternator is running amd charging, there is nominally 14.5v from the stator via the control diodes to the voltage regulator and hence the IND terminal, and from there to one side of the warning light. System voltage is now 14.5v connected via the ignition switch to the other side of the warning light, and with 14.5v both sides the light is extinguished. However that is of secondary importance in alternator systems. Dynamo systems have residual magnetism in the iron components which generates a small output voltage as soon as the armature starts spinning, which is fed to the field windings by the control box, which generates a larger output voltage and so on up to full output (see Dynamo Control Box for details). Alternators have much less residual magnetism and need something else to feed that initial current through the field windings to start generating an output, and that is where passing warning light current through the field winding comes in - it 'primes' the alternator to start charging once the engine is started. However this isn't enough by itself, which is why if you start an MGB without choke or throttle the warning light probably won't go out, the engine has to be revved above about 900rpm. At that point the process is the same as for the dynamo i.e. generated output is fed to the field (via the voltage regulator) which generates a higher output and so on, until the output reaches 14.5v. However in practice even without a working ignition warning light the alternator on an MGB should start charging if the engine is revved to about 3k, and once charging it should continue to charge down to the normal level of about 600rpm. Dynamo systems being less effective will stop charging at about idle speed, which is when you see the warning light flickering. But just as alternators have a higher output at a given engine speed they also keep charging to a lower engine speed. As all alternator-equipped cars should have an idle speed of 700rpm or more they should always be charging at idle, and you should never see the warning light glowing once it has gone out ... except when you switch off a running engine. When you switch off a running engine with the alternator charging, the ignition switch disconnects system voltage i.e. nominally 14.5v from the ignition switch side of the warning light. However that side is also connected to all the ignition powered circuits, each of which is connected to earth at some point. Back at the alternator, while the engine is spinning down the alternator is still generating it's output voltage, which is connected to the IND terminal via the control positive diodes and hence to the alternator side of the warning light. So the warning light has alternator voltage one side, and on the other via the coil, fuel pump, instruments and so on it has several relatively low resistance paths to earth, so the warning light will glow again. But only while the engine is spinning down, as it slows the light will flicker and die.